Hot chocolate is a staple around here, but we sometimes get tired of the usual cocoa mix (cocoa + icing sugar) swirled into warmed milk. Since we’re all fans of peanut butter and chocolate, years ago I tried swirling a spoonful of creamy peanut butter into hot chocolate, and it was a hit. Rich and delicious, it’s enough of an energy boost to take with you in a Thermos to the ski hill, skating, or when you come inside after some snow shovelling or snowman-building. 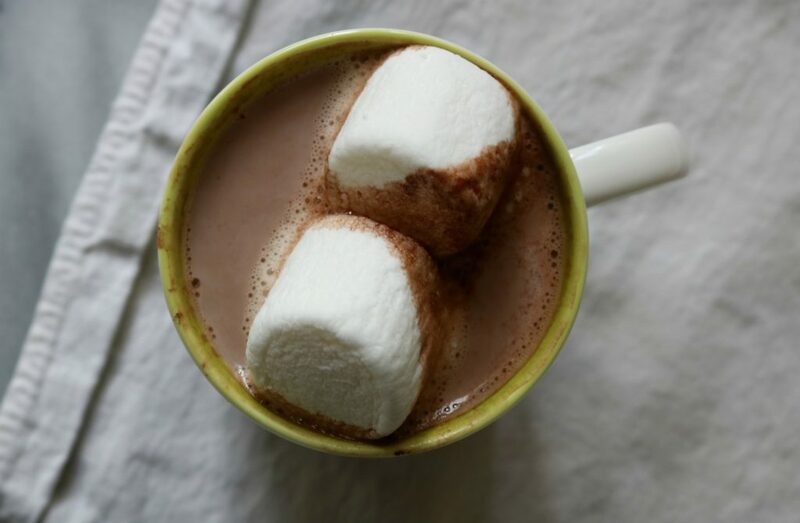 In a saucepan, stir together the sugar and cocoa to get rid of lumps; stir in the water until smooth, then whisk in the milk over medium-high heat. Heat until steaming. Remove the pan from the heat and add the peanut butter and chocolate. Let it sit for a few seconds, then blend it with a hand-held immersion blender. Or for individual cups, divide the chocolate among the cups and pour the warm milk overtop. Whisk until perfectly smooth. Add marshmallows, if you like. Posted in Recipes, Beverages and tagged snacks, Chocolate, beverages.